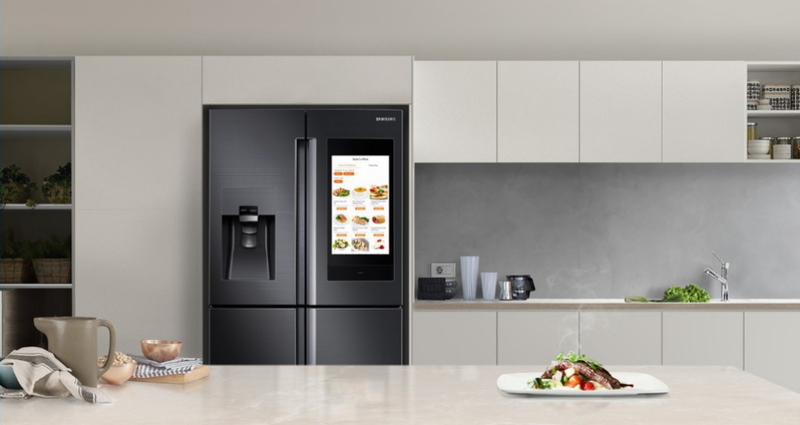 In 2016, Samsung announced its aim to launch a “revolutionary advancement that changes the refrigerator category in meaningful ways.” Since then, the subsequent versions of the Family Hub have continued to get better and better. At CES 2019, Samsung unveiled the new Family Hub, one of the company’s most anticipated products that has been packed with upgraded features. The new Family Hub is all about giving over more time to the family, offering them a communal, emotional and cultural experience in the kitchen. Popular smart features – including built-in view cameras, voice recognition technology and music and radio streaming – are all there. But Samsung has taken it to the next level by enriching the core values of the Family Hub with enhanced AI and IoT capabilities. Let’s take a look at what the company has put in the new smart kitchen assistant. According to a survey conducted by Samsung, over 60% of Family Hub users in the US are families with children. That’s why Samsung paid close attention to updating this distinct feature. 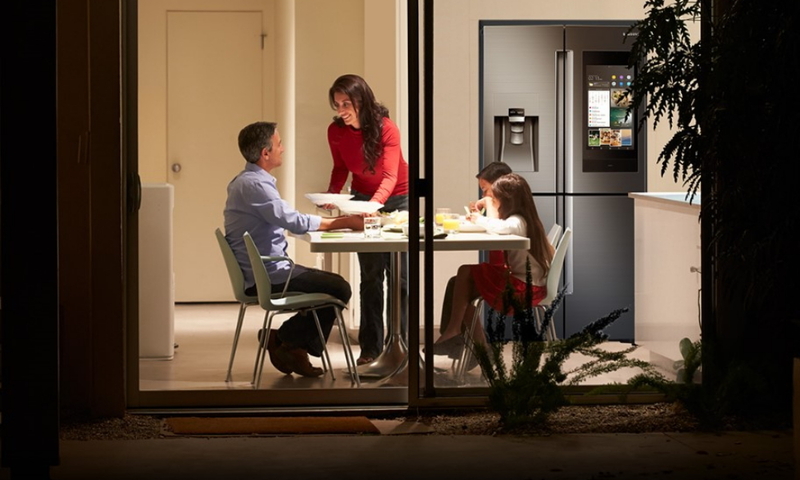 The Family Board allows family members to interact with one another and share countless memories, giving the refrigerator’s screen a familiar, analogue feel. Meanwhile the Home Screen offers a digital service experience with an overview of important information and apps. The new Whiteboard has been updated with smart calligraphy that can recognize handwriting and a drawing function that can identify the objects depicted. There is also a dynamic screen saver feature that can be used to display precious family moments or blend into your home with ambient mode when Family Hub’s touch screen is not in use. Another feature that sets the 2019 Family Hub apart from previous iterations is support for the new Bixby. The new Bixby offers more services, allowing users to seamlessly control and monitor home IoT devices and services from the kitchen with your voice alone. For example, when you run out of ideas on what to cook for dinner, you can ask the new Bixby to search for recipes that cater to your taste and new Bixby will respond with suggestions. You can also check the weather forecast ahead of time, so if new Bixby tells you that rain is on the forecast, you can set a reminder to tell the family to take an umbrella. With a 21.5-inch touchscreen, users can also check at a glance whatever weather charts or recommended restaurant lists and ratings that the new Bixby finds. A lot of multitasking is required in the kitchen, so it can get quite hectic when you have to chop, prepare, and cook dishes at the same time. It gets even more tricky when your phone starts to ring. With an enhanced Smart View, multitasking is made easy, as you can mirror third-party apps on Family Hub’s screen seamlessly from your Galaxy phone, without the need to run the Smart View app on the fridge. 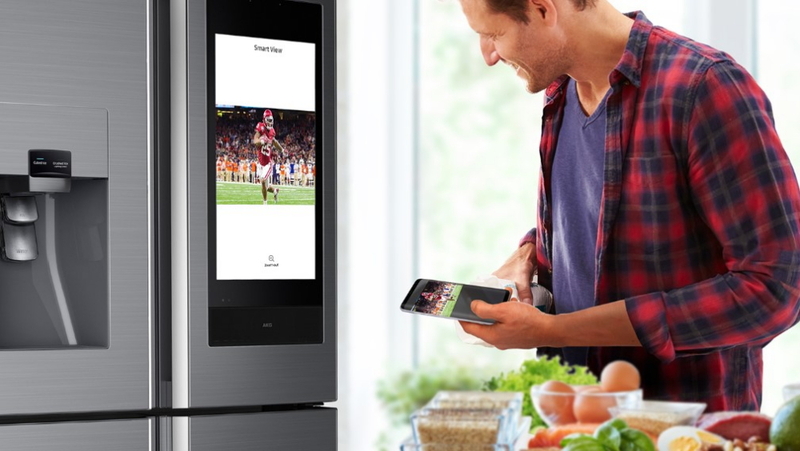 Not only does the new Bixby allow you to answer a call hands-free, you can also browse through the millions of third-party apps available for the kitchen. It’s now even easier for users to manage their apps on Family Hub, with efficient installation, updates and deletion from the Apps menu. On top of that, the Home Service can set the mood with music when you are preparing a small gathering or turn on your favorite playlist while you are cooking. Last but not least, the kitchen experience has become more intelligent and efficient with updated features for Food Management. With the new Family Hub 2019, you can search for healthy recipes or preset the oven directly from the Recipes app with easy-to-use voice features. You can also add items to your Shopping List or tag items for reminders and expiration dates.